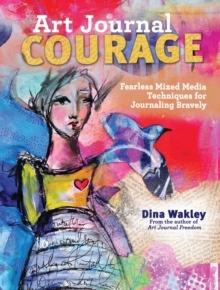 Gather Your Art Journal Supplies: * Journal * Pens * Paint * Courage! Discover the techniques and courage you need to journal bravely! With Dina's help, you'll begin by working through any fears you have of using your own handwriting. You'll get journaling prompts and techniques to help you develop a handwriting style you'll love and words you'll want to write! Then, you'll move onto drawing: you'll learn not only how to train your hand, but also how to appreciate your own unique drawing ability. As you continue through the eight chapters, you will learn additional mixed-media techniques to help you overcome your fears of new materials, using photos of yourself, creating layers, working without a plan and much more.